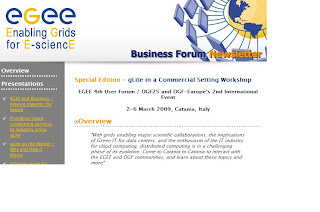 The Business Forum Workshop, gLite in a Commercial Setting - Now and in the Future, is geared to explore the future potential uptake of EGEE's open source middleware in the business world. Steven Newhouse, EGEE-III Technical Director, spotlights current achievements and challenges. Talks are by two EGEE Business Associates, Bernhard Schott from Platform Computing, and Nick Trigg, from Constellation Technologies, as well as CGGVeritas; COMETA; and EGI. Come along and join this crucial debate.